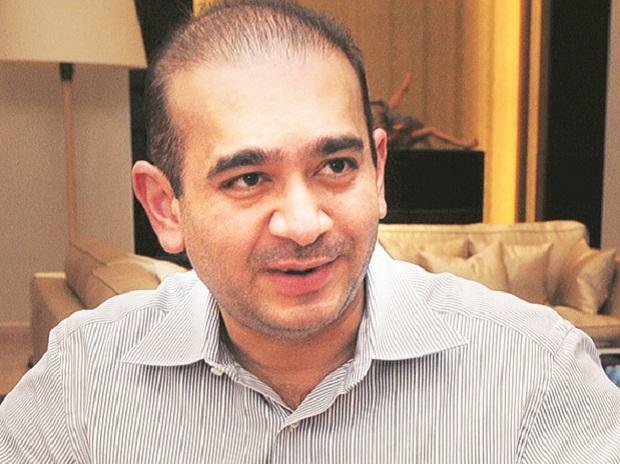 How did fugitive jeweller Nirav Modi pull off what he is accused of — the country’s biggest banking fraud at Punjab National Bank, worth over Rs 14,000 crore — without an army of trusted lieutenants while keeping his moves under wraps? After all, he employed over 2,200 people and it’s a matter of conjecture as to why someone didn’t blow the whistle earlier. It turns out that while his family council was involved, he also — according to a report submitted to a US Bankruptcy Court by an appointed examiner — had a highly organised core management team. The common denominator: They were predominantly Gujarati, mostly male, and either related by blood or very well-known to Nirav. The family: Nishal Modi who was his half-brother and in charge of diamond trading was a director and has a look out notice on him and is wanted by the authorities. 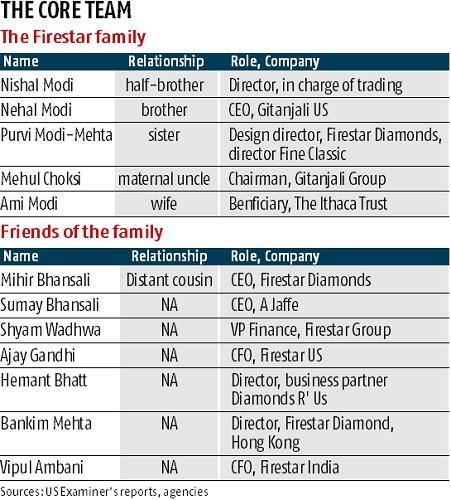 Nehal Modi, Nirav’s other brother in New York was reportedly a consultant with Firestar and involved with the Ithaca Trust, an entity set up to fund and buy real estate for the fugitive jeweller through questionable sources of finance. Mehul Choksi, Nirav’s uncle and mentor, and boss of Gitanjali Group, is hiding out in Antigua. Purvi Modi Mehta, Nirav’s sister, managed the Hong Kong business but was not a key director in the holding companies, sources say, adding that she and the brothers were intentionally put in positions with no or very limited liability, but supported Nirav by transferring funds when required. Nirav’s wife Ami Modi is supposedly in the United States and like Purvi assisted by transferring funds through her account when required, according to the examiner’s report. There’s a look out notice on her and she has also been recently charge-sheeted by the enforcement directorate. Nirav’s sister was also involved with other facets that involved shadow companies and transferring money to various group companies as well as to Nirav’s wife, according to the report. Choksi's daughter Priyanka wed Antwerp-based diamond merchant Akash Mehta in 2011. At the time Priyanka was running A.Jaffe, in which Nirav had invested and was deeply involved in. A.Jaffe was also a company that allegedly saw funds from LoUs routed through it. Former CEO of Firestar Diamonds and Firestar India Mihir Bhansali, who is Nirav’s cousin, worked closely with him and allegedly had involvement that ran deep into the shadow companies — a set of firms that were supposedly created by Nirav to divert funds. Bhansali, a graduate from Babson College and HR College of Commerce and Economics, was Nirav’s “de facto number 2” and is alleged by the Indian authorities to have a significant control over the entire group. In May 2017, Bhansali allegedly directed Shyam Wadhwa, an alleged Nirav confidante and employee of Firestar India, to replace the director in Hong Kong with Bankim Mehta a diamond trader in New York working for FDI. In an interview with the examiner, Mehta admitted that he did little more than sign paperwork. In other discoveries by the examiner, managers of shadow companies say that Bhansali trained them to say they were jewellers with several generations of experience when in fact they were just Firestar employees. A.Jaffe CEO Sumay Bhansali is also the brother of the wife of Anurag Jain, the boss at Parag Diamonds, the company which ended up buying A.Jaffe for $8 million at its bankruptcy sale. It was valued at $22 million. It’s not clear whether the two Bhansalis were related. Vipul Ambani, CFO of the firm’s India operations, was arrested and had been in jail for a few months when the scam broke. He has since been released but the extent of his involvement is not clear. Working shoulder to shoulder with Mihir Bhansali was Ajay Gandhi, CFO of the US-based Firestar companies, who received his Bachelor’s degree in India and became a licensed CPA in 1994 after graduating from York College in New York City. Gandhi allegedly had control over all of Firestar’s financial transactions including managerial sign off on loose diamond transactions with the shadow companies that were worth hundreds of millions. His day-to-day role at the US entities included checking all account balances, monitoring cash flow, reviewing payments, managing payables, and receivables and reviewing inputs from sales teams. He would also sign monthly borrowing certificates for lending banks IDB and HSBC and based on the reviews by the examiner’s team it’s inferred that he clearly controlled the finances of the debtor entities. In several interviews with the examiner, Gandhi was quizzed about his knowledge of shadow companies and their ties to the debtors. In his first interview he said he only knew that they were Bhansali’s customers. Bhansali allegedly hired proxy or placeholder employees who would do what they were asked to without question. This included the likes of Hemant Bhatt, who — though identified as Nirav’s business partner and director in the group’s oldest company Diamonds R Us — was, some former employees say, just “the canteen supervisor at the India Office”. According to Firestar India’s general manager of accounts Saju Poulose Parokaran, the authorities were told Bhansali requested he “select some of the trusted employees from the company who do not apply much brain to work for Firestar overseas entities”.